I’m thinking writing about this will involve more than one post. May I suggest that anyone interested in the Earl Grey Irish Famine Orphans should get hold of a copy of the NSW Legislative Assembly’s Report and read it for themselves? If you are in Australia, perhaps ask for help in your State Library. Here’s what I’m talking about. There are 78 pages in all. Despite its title, the Report and its minutes of evidence, is largely concerned with the Earl Grey female orphans. The NSW Immigration Agent’s Report for 1854 [H.H. Browne, he of ‘Cancelled Indentures’ fame] asserted, “the single females were, I regret to say, the most inferior that have, since the Orphan Immigration, come under my observation…”. His nose had been put out of joint by the arrival of the Lady Kennaway, 8 December 1854, carrying a large number of single females from the Cork Union Workhouse. Here is the link to a shipping list held in the State Records of New South Wales, http://indexes.records.nsw.gov.au/ebook/list.aspx?Page=NRS5316/4_4791/Lady%20Kennaway_8%20Dec%201854/4_479100349.jpg&No=4 …Bridget Savage, 18 year old needlewoman born City of Cork, daughter of William (decd.) and Margaret (in Cork), Roman Catholic, cannot read or write; Eliza Crowley, 20 year old housemaid, born Killcreagh, County Cork, daughter of Mark and Mary, both dead, Roman Catholic, able to read; Margaret Dennehy, 16 year old, never in service, born Mallow, County Cork, daughter of William and Mary, father dead, mother in Mallow, Roman Catholic, could neither read nor write…, a traffic that had supposedly ended in 1850. Matters became worse when it was found “certain irregularities” had occurred during the voyage. 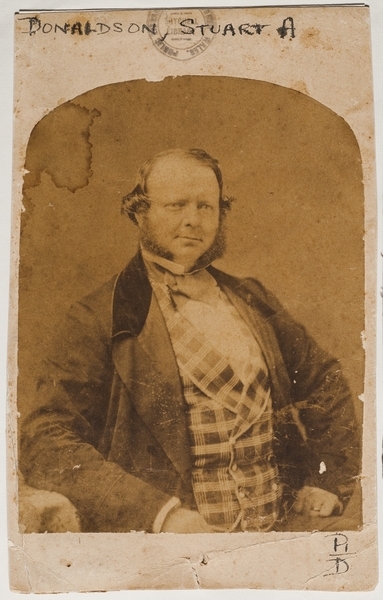 Under the chairmanship of Browne, the Immigration Board’s report on the ‘irregularities’, dated 5 February 1855, finished with the insulting comment, “orphan immigration having been so distasteful to the inhabitants of this colony, the Board did not contemplate the arrival of any fresh draft of that class of immigrants“. And urged the Governor-General, Sir W. Denison, to tell the Colonial Land and Emigration Commissioners in London “not to continue this description of emigration, it being most unsuitable to the requirements of the colony, and at the same time distasteful to the majority of the people”. See http://trove.nla.gov.au/ndp/del/page/1493153?zoomLevel=1 Sydney Morning Herald 7 July 1858, p.3 cols.4 & 5. “The proportion of the sexes must be kept up, and as the English and Scotch girls will not emigrate, the Irish are the only ones left to apply to. The alternative, we have no doubt, is not a pleasant one to the colonist, who has set his heart on having a nice, tidy, English maid-servant to rub his furniture and make his beds, and has in her place a half wild nymph from Tipperary, whose nearest approach to the domestic service has been driving bullocks or feeding pigs. No contrast could be greater“. Perhaps the reason for the delay was the Sydney Irish were preoccupied with political matters, such as the coming of Responsible Government and with it, new immigration/remittance policies? In time, all the arrows and mud slinging became too much, even for the most conservative among them. The sheer number of insults thrown at young Irish women should have been enough to spur them to action. But add bad publicity about Irish immigrants, generally, that appeared in both the colonial and Metropolitan press: the London Times even mentioned Governor Denison’s despatch to George Grey with its threatened reduction in the number of Irish immigrants. And someone eventually took up the cudgels. At last, by late 1857, the Australian Celtic Association began to organize a petition against “the officious and unjust censure of Irish orphan girls”. Respectfully showeth,–That the Immigration Agent has, in their opinion, misrepresented the Irish female immigrants as being most unsuitable to the requirements of the colony, and at the same time distasteful to the majority of the people. That he has thereby misinformed his Excellency the Governor General, and thus attempted to overrule the instructions sent by this Government to the Emigration Commissioners at home, “to apportion the emigration from the different divisions of the United Kingdom to the population of each”. That to your petitioners apprehension the Legislature is alone competent to determine the description of emigrants, as well as their relative proportion from each country to the population of the United Kingdom, that should be brought out at the expense of the land fund of the colony. That your petitioners humbly request that a committee of your honourable house be appointed to enquire into the conduct of H. H. Browne Esq., Immigration Agent, regarding his communications to the Colonial Secretary, marked Nos. 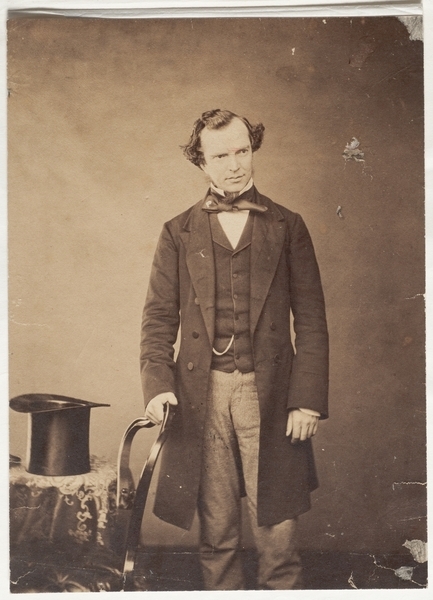 1 and 13, referred to by his Excellency the Governor General in his despatch to Sir G. Grey, dated Sydney, 2nd March 1855; and that the proposed committee should also take into consideration what further steps ought to be taken to render the emigration department more efficient in supplying the inhabitants of the interior with female servants, than at present it is found to be. It was not the best or most aggressively phrased petition: it left plenty of room for compromise. But it achieved its purpose. Mr Daniel Deniehy, Mr Stuart Donaldson, Mr Peter Faucett, Mr Owen, Mr Henry Parkes, Mr Murray, Mr Williamson, Mr Henry Rotton, and himself, the mover, George Thornton. [It is worth consulting the ADB (Australian Dictionary of Biography) to learn more about these men]. 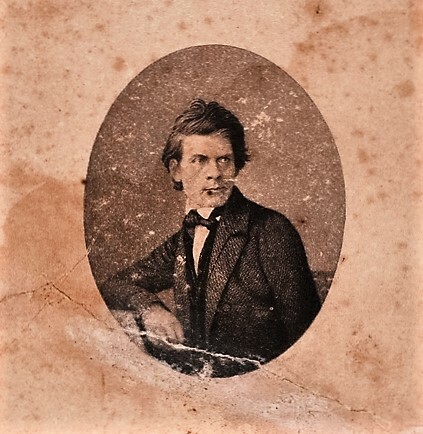 George Thornton’s proposal was accepted. The Select Committee was to meet on several occasions between 6 July and 22 December, 1858, before drawing up its report in early 1859. What it had to say about the Earl Grey Famine orphans will be the subject of a later post. This entry was tagged Archdeacon McEncroe, Bridget Savage, Celtic Association, Cork workhouse, Daniel Deniehy, Eliza Crowley, George Thornton, Immigration Agent H. H. Browne, J.H. 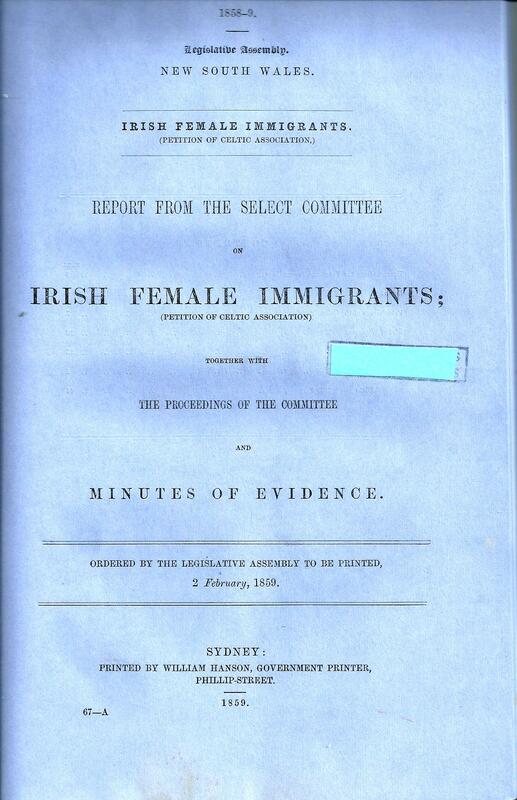 Plunkett, Lady Kennaway 1854, Margaret Dennehy, NSW Legislative Assembly Report, Report on Irish Female Immigrants 1859. Bookmark the permalink. Many thankyous Peter. May I ask you to send your information about Bridget to the Irish Famine website at Please, if you haven’t already done so. Thanks Kay. Let me leave your questions there for a bit. Maybe someone would like to help answer them before I put my foot in my mouth. It looks like we’ll have to wait for the cows to come home before anyone else replies. I imagine one could find affirmative answers to most of your questions, if that is all one was looking for…with differences according to time and place…fear of Irish male convicts specially in the early days of NSW…everyone looked down upon if they had any association with the Poor House…cartoon caricatures of Irish female servants in the colonial press in the 1870s…a long running sectarian sore that lasts till late 1960s. On the other side of the balance is the fact the Irish were always a large minority, and fitted in to communities through religious bodies, through education, as lawyers,and politicians, and as marriage partners. From an Irish perspective it is strange to think there was ever something that could be described as an Anglo-Celtic Establishment!! And yet that seems to have occurred here. Mind you, maybe someone more knowledgeable than myself has a different view? It definitely seems to have been association with the workhouse in the case of the Irish girls. Some years later, in 1874, there were harsh attacks in the media in New Zealand on the migrants they were bringing out from Ireland. The local press questioned the policy of bringing a lower class of migrant and asked the government to consider whether these were the kind of girls they wanted to be parents of future New Zealanders. They described these girls arriving on ships as “tainted cargo, little short of a public calamity” and said they were useless in Ireland, so what use would they be in NZ where there was no workhouse to take them back in. There was such animosity towards them that many of the girls could not find employment when they arrived as they were considered immoral. The Roman Catholic Church was forced to publicly defend the moral character of these girls but that did not prevent calls for the girls to be sent back to Ireland. Sure but it is an oversimplification to think that is all that was involved.